To make chocolate look good, with a high gloss, and have a good snap it must be tempered. Tempering chocolate ensures that all the fat in the chocolate sets in the correct crystalline form. To understand tempering we must first understand the structure of fat. The vast majority of the fats in chocolate are triglycerides. A triglyceride is a class of fats made up of glycerol linked to three fatty acids. Furthermore, three main fatty acids account for about 95% of the fat present. 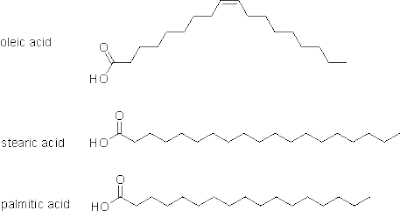 These three fatty acids are oleic acid (35%), stearic acid (34%), and palmitic acid (26%). Stearic and palmitic acid are saturated fatty acids, meaning all of the carbon atoms are saturated with hydrogen, while oleic acid is a monounsaturated fatty acid, there is one double bond which could be hydrogenated. Fatty acids are called fatty acids because they have a long aliphatic carbon chain with an acidic carboxylic acid group at one end. This diagram shows one of the ways these fatty acids are attached to the glycerol. Shown here is what is known as a SOP triglyceride because it has stearic acid attached to the first glycerol carbon, oleic acid in the middle, and palmitic acid in the third position. If we were to switch the oleic and stearic acids it would be a very different molecule. As I said earlier stearic and palmitic acids are saturated while pleic acid is unsaturated. So our triglyceride is one of a subset of triglycerides found in cocoa butter known as SOS triglycerides. This set of triglycerides has oleic acid sandwiched in between two saturated triglycerides. SOS triglycerides make up 80% of the fat in cocoa butter. Because the fats in cocoa butter are primarily SOS triglycerides they melt over a short temperature range (room temp to body temp). Cocoa butter is polymorphic which means that it can crystallize in multiple arrangements. Carbon is also polymorphic, it can be a diamond, graphite, or a bucky ball. While carbon has three polymorphs cocoa butter has six. These six forms were named by two different groups in the same year (1966). The chocolate industry uses Roman numerals I-VI as described by Willie and Lutton, while the oils and fats people prefer using Greek letters with superscripts and subscripts as set forth by Larsson (γ, α, β'2, β'1, β2, β1). Only one of these six polymorphs (form V) forms the shiny, firm chocolate that gives the nice snap when broken that we like. If we want to enrobe a truffle or a strawberry with chocolate and we want it to snap when we bite into it we need the chocolate to be in form V. Luckily chocolate comes from the factory in form V. If we can keep it there we will have lovely chocolates. Therefore our goal when we melt the chocolate is to never heat it above 91°-92° F.
Most chocolate melts between 89° -91° F even though all of the form V won't melt until you heat it above 95° F. Between 91° -95° F the chocolate still contains some form V microcrystals of cocoa butter. If you let the chocolate harden around these seed microcrystals it will all form form V chocolate. If however you completely melt all of the precious form V crystals you need to start over by completely melting all of the chocolate. Be careful not to burn or separate the chocolate by heating it too high. Next you should cool the chocolate rapidly to about 80° F and always use constant stirring. Cooling this low does allow some of the form III and IV crystals to form, but it gets a good start on the crystallization of the highly prized form V crystals. Now gently warm the chocolate to 86° F. This start the will start to melt the form III and IV so it should be held at this temperature for a few minutes, then warmed up to 91° to 92° F . This will finish melting all of the form III and IV crystals that were formed while cooling. You can now test the chocolate to see if it is in temper by spreading a smear out on a piece of waxed paper, if it dries shiny and hard within 5 minutes your chocolate is tempered. Now that you have tempered chocolate you should eat it and enjoy. Just be careful about bloom (we'll get to that next time).